In the evening quarter-finals, the pair then pulled off a notable upset over Tesni Evans & Peter Creed of Wales (pictured above), fighting from behind in the second to clinch a tie-break and beat the third seeds 11-8, 11-10 in 38 minutes. “When you play two matches a day, it’s really hard to regroup and come back stronger in the second because you’re so used to just playing one match a day,” said Pallikal. 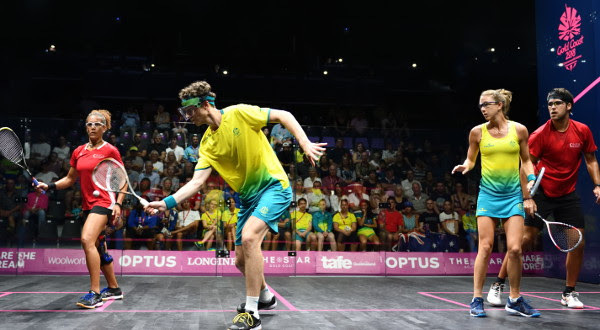 “When you mess up one match in the Commonwealth Games you’re out for four years, rather than when you play PSA you can come back the next year and play it again. Ghosal continued: “Very rarely do you have an entire event when you play the way you want to the whole time. You’ll have a day when you’re not feeling the ball well, or your body’s not moving well. I think the morning match was something like that. “But credit to the Malaysians, they played really, really well. We had to get through that match and sometimes when you get through matches like that, it gets you better. The pair are playing the Commonwealth Games for the first time together since Ghosal married his partner’s sister. “I’ve known Dipika since she was about nine or ten and we’ve always been close – and I dated her sister for a very long time, since I was 16, so we’ve known each for a long time. 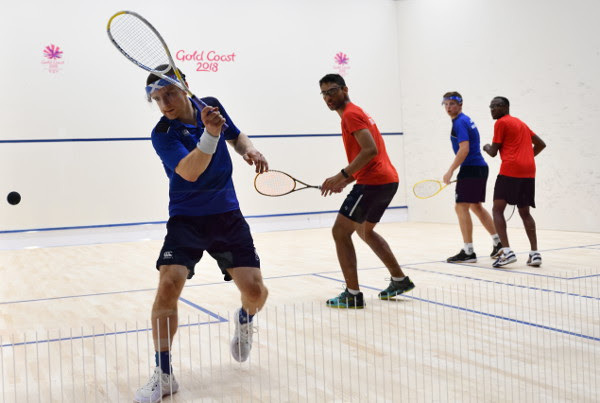 The other Mixed semi will be the Anglo/Australian affair predicted by the seedings – featuring the second seeds Alison Waters & Daryl Selby, of England, and fourth-seeded Aussies Donna Urquhart & Cameron Pilley (pictured above in morning action against Cayman Islands). Incredibly, both pairs survived tense and emotional domestic derbies – in which each pair’s opponents included their own partner in the other doubles event! 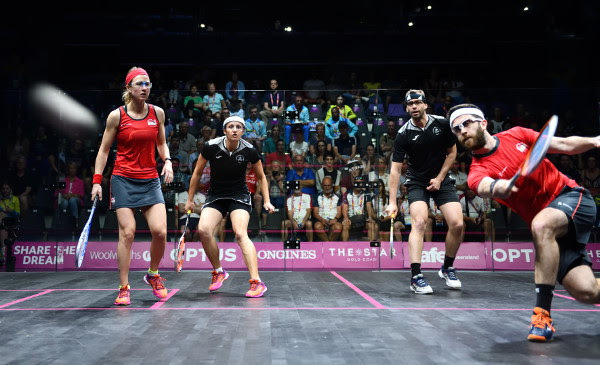 But it was on one of the sidecourts that Waters and Selby squandered a one-game lead to let their opponents Jenny Duncalf & Adrian Waller, the No.7 seeds, draw level – then lead the decider 10-8. “We’ve obviously trained a lot together and every time we play in practice it’s really close,” explained an emotionally-drained Selby (pictured above during the morning match against Malta). “They’re a really good pair and have both improved a hell of a lot. We knew it was going to be tough. “I think we played the first game well and half of the second game really well – but I think we just saw the finishing line and both us were guilty of hitting a few errors and making a few mistakes and letting them back in. And they capitalised extremely well! “Alison dug in and did what she does best. I’m proud of her. We came through from 10-8 down! “But it was very emotional. I felt joy and sadness in equal amounts – genuinely! We’re all so close: Adrian’s my doubles partner and Jenny and Alison play together. It was really horrible to play in that match. The unexpected Malaysian success in the Men’s Doubles extended play late into the night. It was an all-Malaysian clash between experienced pair Nafiizwan Adnan & Ivan Yuen, the eighth seeds, and event newcomers Mohd Syafiq Kamal & Eain Yow Ng, seeded in 10th place. 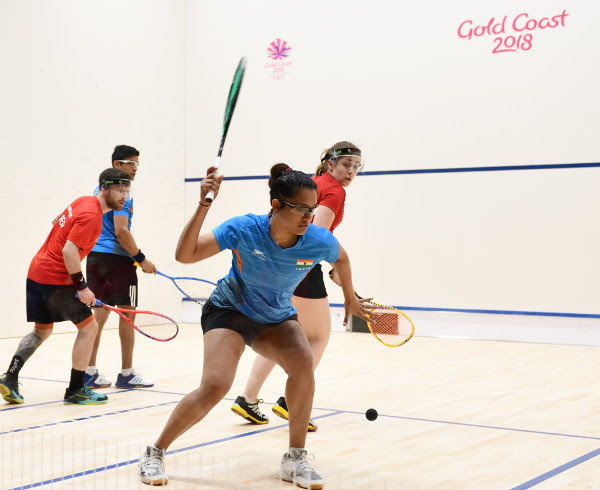 With a place in the quarter-finals at stake, it was underdogs Kamal & Ng who ultimately prevailed – winning 4-11, 11-9, 11-10 in 76 minutes, the longest match of the day. Scottish medal hopes rest exclusively with Alan Clyne & Greg Lobban, the second seeds in the Men’s doubles. The experienced pair despatched Trinidad & Tobago’s Mandela Patrick & Kale Wilson (see below) 11-2, 11-5 in just 13 minutes to secure a slot in the last eight.